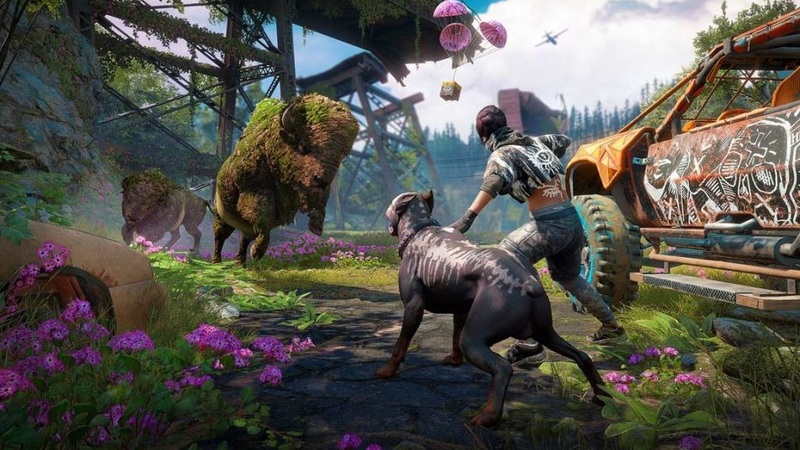 Earlier this month, GameCritics was invited to a preview event featuring Far Cry: New Dawn, and the first thing I noticed about it was how colorful it was. Not that its predecessor Far Cry 5 was a bland game — far from it. It’s just that in New Dawn, nature seems to have taken on a more vibrant sheen since the last time I explored Hope County 20-odd years prior, according to its premise. 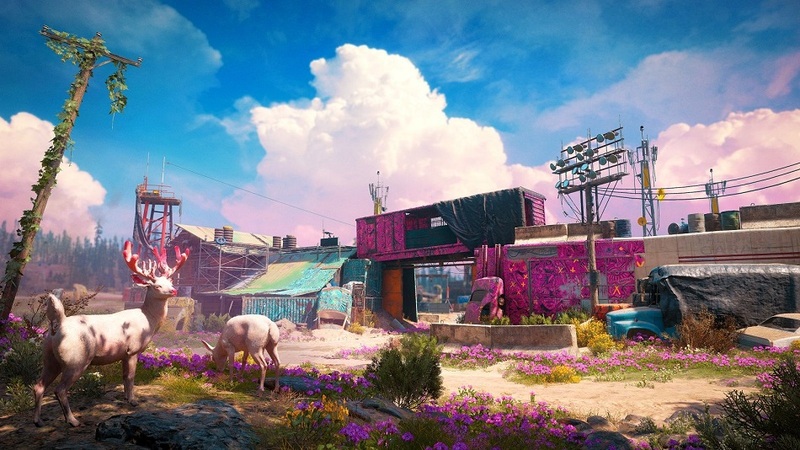 Perhaps the radiation from the apocalypse Joseph Seed’s predicted in FC5 helped promote the bright cobalt and vermillion found in the local flora? Abandoned towns are overgrown with lush emerald overtaking sterile browns. The night is awash in a sea-green and violet aurora while murderous antagonists splash hot pink and sky blue across their sporting goods surplus outfits. In the time since Seed’s predicted “Collapse” happened, the survivors of Hope County have rebuilt their lives alongside the remaining members of the Project at Eden’s Gate cult in a strained, but seemingly peaceful relationship separate from one another. For the most part, it seemed things were going well until a roving pack of marauders known as the Highwaymen came along to pillage the area, setting up the central conflict. So far, this open-world first-person shooter seems to be about rebuilding from disaster. In fact, the player character is part of a roaming militia that helps communities find new footing from Montana, all the way to the West Coast. 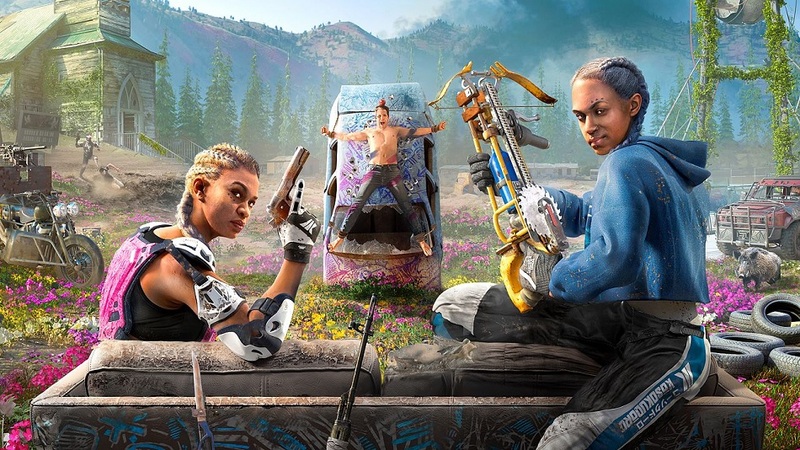 What was supposed to be a simple helping hand quickly turns violent as the aforementioned Highwaymen and their sadistic twin sister leaders, Micky and Lou, see Hope County’s newly-restored town as another town to loot, pillage, and burn to the ground. The Highwaymen start off being easy enough to deal with. Most of them go down with only a few shots, and adding a bit of an RPG element to the mix, players can see health bars (new to the FC series) tick down with each bullet. As I started to make progress, however, that would change. The Highwaymen get better gear, they have stronger weapons, more life, thicker armor, and so on. In order to deal with these increasingly tougher challenges, I needed to upgrade the survivor encampment I was calling home for the time. Want to use something more powerful than the rusty pistol? Then it’s time to upgrade that workbench in the corner. Putting resources into supporting a cartography team will create maps of item stashes around Hope County while improving the garden will yield better health packs. 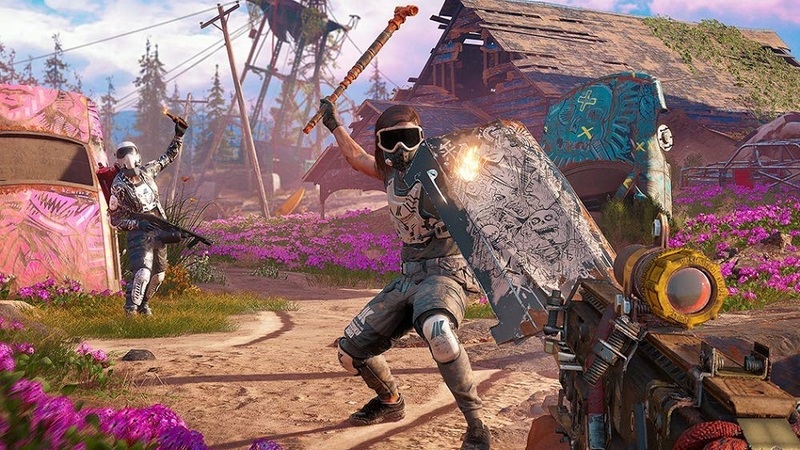 Even followers such as Carmina Rye (daughter of Nick and Kim from FC5) and ‘Merica-loving Hurk can be improved to take and dish out more damage. All it takes is a bit of scrap and a lot of Ethanol — in fact, every single improvement needs a fair collection of scrap found in the world and a heaping helping of Ethanol. It’s here where the game feels more like Far Cry 5 with mods than a standalone game. Most of the ways to obtain Ethanol are from activities that were found in the previous entry. Rescue this truck filled with civilians, get a few drops. Liberate that outpost and here, have a barrel. These events feel so cut and pasted from FC5 that I even recalled hitting a convoy on the exact same part of the map in FC5 that I did in New Dawn, giving me a sense of deja-vu and a fear that I was just playing Far Cry 5 again. There’s one other way to regularly gain Ethanol, and that’s to fly away on an Expedition. Expeditions are small forays into the world outside of Hope County to raid supplies. The one I saw took me to an abandoned aircraft carrier where the goal was to sneak in, steal whatever I could, and shoot my way out before getting evacuated from a nearby beach. It was an entertaining, bite-sized chunk of chaos and I hope other Expeditions will change things up similarly. I’m still excited to play New Dawn when it comes out, but I’m worried about quickly getting burned out — it’s been less than a year since Far Cry 5, and by the time I rolled credits on it, I wasn’t craving more. Sure, New Dawn has a few extra mechanics, but based on what I saw at the preview event, I’m not fully convinced that it won’t just be more of the same.